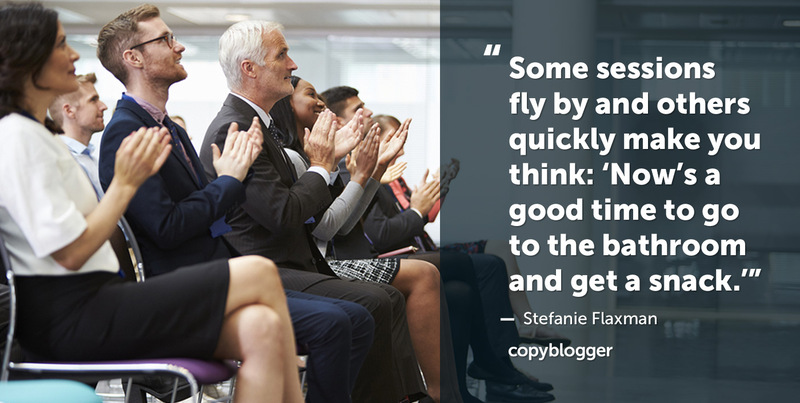 Think back to the last time you were at an event where speakers gave presentations. While a number of factors cause those two scenarios, a common reason for the Bathroom-Snack train of thought is that the speaker didn’t make their presentation audience-focused. The words they chose to lead with may have been relevant and informative, but they didn’t stir up the desire to keep listening. Content is also a presentation. And how you shape that presentation determines whether someone wants to learn from you … or from someone else. “Action” in our content introductions can take a variety of forms, but they all stir up the desire to keep reading. I’m the first to admit that “being outrageous for the sake of being outrageous” is tiring. So, the “unusual point of view” I’m referring to is one that takes advantage of your creativity and research skills; it’s not just a wild statement. It’s about being genuinely bold. Your article may be very similar to others on the same topic. How do you get someone to choose yours? Tell your ideal reader exactly what she wants and needs to hear in both your headline and introduction. You can uncover these “next-level benefits” with a technique I call Extreme Brainstorming. Challenge yourself to get more clear about who you’re talking to and the transformation they hope to achieve. Write down all the different ways you could state the most compelling benefits of your article, narrow down your top choices, and then select the strongest one. Readers choose the articles that most closely relate to their specific struggles. Of course, your content must deliver on your headline’s promise. That’s how I started this article. I asked you to “Think back to the last time …,” which invites you to explore today’s topic with me. When your introduction only explains information, you don’t show your reader that you have something to offer that they won’t find anywhere else. Here’s a straightforward way to engage while you explain. Try combining this Action Type with Action Type #1 and Action Type #2 above to introduce that unique point of view you have or next-level benefits you want to immediately communicate. Readers should feel confident about choosing your article — which will increase the chances that they’ll want to check out your content again in the future. We all love something new. Something we haven’t seen before. That’s why compelling introductions are directly related to growing your audience. That first impression is your opportunity to persuade. Show a new reader that you’re not like everyone else. How much time do you spend on your introductions? Do you have any favorite techniques that help you stand out? I often start my blog post by engaging the reader immediately by asking a question. “Have you ever…. ?” “What would you do if…?” “What was the last time you….” A command works too: “Just imagine you are….” “Don’t ever do…” I try very hard to make my introductory sentence and paragraph ask something of the reader so he or she feels engaged. Then of course I hope the rest of the story doesn’t disappoint! First of all, I’d like to thank you for this exquisitely written article. The very first thing I’d like to say is that this article is expressing itself from a different point of view, which is the biggest actionable example that this post is trying to say to its audience. #1 An unusual point of view: This is the most fascinating point I’ve come across while reading this article. The three bulleted points are the main ingredient to win or stand out in the extremely competitive Content Marketing game (depending on the niche someone is in). The word “unusual” really compelled me to read the whole point! #2 Reader participation: This point is directly linked to engagement and building an email list. Since the point is insisting us to write in a way so that a reader will want to read another article of that author in the future. Anyways, it’s a great article and helped me inspired to write more compelling articles in the future. Glad you noticed the use of these concepts in the article, Raktim! I’ve never done too much of the ‘reader participation’ tip. I like using a contrarian point of view or even a juxtaposition to try to pull the reader in. I have to finish an article this afternoon. I think I’m going to try the reader participation tip. Let us know how it goes, Kevin!